These cuddly baby blankets are 100% polyester with fringed edges to ensure baby is happy and comfortable. 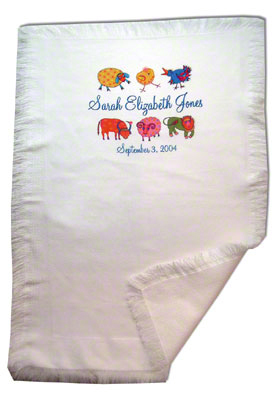 Each blanket can be personalized with baby's photograph, name, birth date, and baby related artwork to create a beautiful baby shower, christening, or birthday gift. The possibilities are endless, and our process doesn't change the "feel" of the blanket. The 26"x37" blankets are available in white, blue, and pink base colors. The entire front-side of the white blanket can be imaged to create a truly unique personalized heirloom. 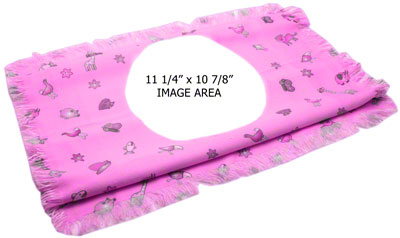 The blue and pink blankets feature a cartoon animal background print with an 11.25"x10.875" oval imaging area. -Available in white, blue and pink base colors. -Fringed edge with the base color of the blanket. 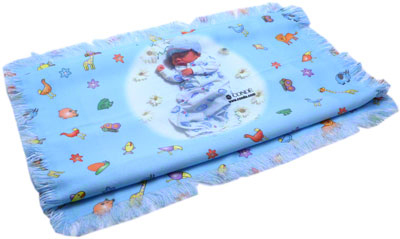 -Blue & pink blankets include a mixed cartoon animal background print & oval in the middle of the blanket. You will notified by email for Photo information for the blanket.